The Chesapeake Bay Seed Capital Fund has invested $250,000 in Owings Mills-based Manta Biofuel Inc., a company developing renewable crude oil from algae at a cost that could be competitive with traditional petroleum. The Chesapeake Bay Seed Capital Fund invests in Maryland-based startup companies with innovative technologies that help improve air and water quality in the Chesapeake Bay watershed. Portfolio companies are jointly selected by fund staff at the Maryland Technology Enterprise Institute (Mtech) in the A. James Clark School of Engineering at the University of Maryland, along with technical staff at the Maryland Department of Natural Resources (DNR). Manta’s patented harvesting technology uses magnetic beads to rapidly stick to algae grown in commercial ponds. 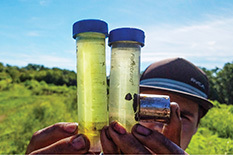 The beads (and algae) are then removed from the ponds and concentrated through magnetic force in a single step, the algae is separated from the beads, and the algae is converted into oil. The beads are reused, as is the nutrient-rich water. Chicken manure is used in the water to speed the growth of algae. While crude oil can be converted into many oil-based products, including gasoline, the company has focused on conventional heating oil initially, shipping its first product in March 2018. Manta is currently scaling up production of its fuel oil product at its 15-acre facility in Thurmont, Md., to meet demand from local customers. Manta’s algae-harvesting technology was licensed from the University of Maryland Center for Environmental Science. Powell invented the harvester while earning his Ph.D. at the Institute of Marine and Environmental Technology (IMET). Manta has raised $3 million in total funding from the U.S. Department of Energy, Maryland Industrial Partnerships (MIPS) program, Chesapeake Bay Seed Capital Fund, Invest Maryland Challenge, TEDCO Technology Validation Program (TVP) and the Institute of Marine and Environmental Technologies REEF program. The Chesapeake Bay Seed Capital Fund, created in 2008, is supported by funding from the Maryland Department of Natural Resources and is administered by Mtech. The investment is the fund’s second into Manta; the first was for $150,000 in 2015. Previous Chesapeake Bay Seed Capital Fund recipients include: Manta Biofuel, PaverGuide Inc., Smart Slope LLC, Traffax Inc., and Zymetis (now Aemetis Inc.).